TUTANEKAI “Tui” Wordley should be an inspiration to every surfer. 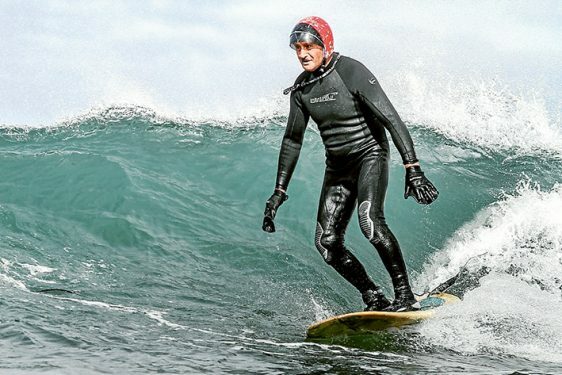 Not because of the size of the waves he rides or the latest overseas trip he’s made, but because, at 80, he’s still out there, catching swells that bend towards the shore, steepen up and then crash down, peeling off to the right or left. He’s at home on Western Port’s reefs and points and the beach breaks at Gunnamatta or Phillip Island with visits to the west coast, from Torquay to Lorne, when the surf is on. A New Zealander by birth with a mixed Scottish, English and Maori pedigree, Wordley came to Australia by way of Papua New Guinea about “30 odd years ago”. He was working in the PNG highlands as a motor mechanic when he met his wife Julie. She came from Heidelberg and seven years later, when it was time for them to come and settle in Australia, his one stipulation was that “it has to be close to the beach”. 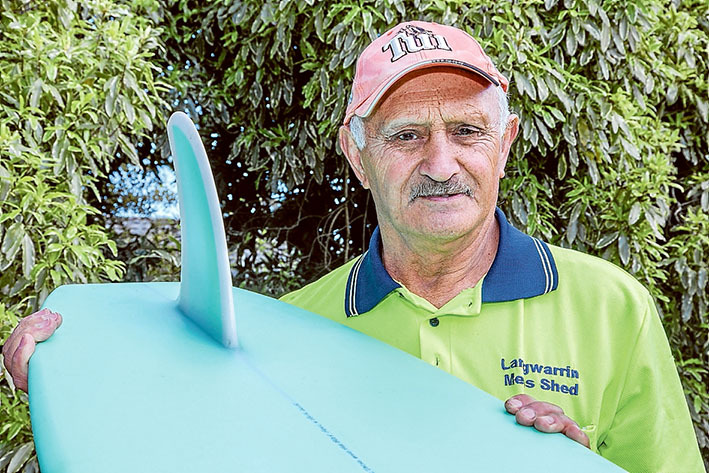 “We came to Langwarrin and have been here ever since,” Wordley says over the phone while working in his shed (he is also a member of the Langwarrin Men’s Shed). A group of friends gave Wordley a new Phil Trigger-shaped surfboard for his 80th birthday. The board, a bit thicker and wider than what he might have been riding over the past several decades, was designed to help Wordley keep enjoying his time in the surf. Four inches thick and 10 foot long by 24 inches (surfers still use imperial measures) wide the board is just what he needs. Wordley likes to knee paddle and the extra buoyancy means more stability and less effort when paddling for waves. A foundation member and the first life member of the Mornington Peninsula-based Maladiction Longboarders, Wordley made and operates a lighting system that signals information about heats to competitors in the water. Although he’s the oldest Maladiction member, Wordley says “those other guys are catching up”. A handyman and mechanic, Wordley has been asked to make similar light systems for other board rider clubs and is always on the lookout for wrecked traffic lights which can be pirated for their coloured lenses. The lure of surfing first hit Wordley when he was in his early 20s while living at Whangarei, north of Auckland in New Zealand. “We saw some guys come to our local beach with surfboards and we’d seen newsreels. The guys making [the early surf movie] Endless Summer came to Raglan to do some filming, which included trout fishing at Rotorua ,” Wordley says. Wordley was a member of the Tatahi Surfriders Club before heading off to PNG in 1969. It was a time he sees as “my best surfing days; I came fourth in the final heat of the first New Zealand national competition”. Tui Wordley and Julie have three sons, Scott, a lecturer in aerospace engineering at Monash University, Brett a site supervisor for housing company Edgerton Homes, and Aaron who, like his dad, was bitten by the surf bug and shapes and glasses surfboards. “He glassed boards for [multi-world champion] Kelly Slater before this year’s Bells Easter contest,” Wordley, who knows a bit about board making himself, says. Although widely known as Tui, the longer version of his first name, Tutanekai, is a character from a Maori legend. Wordley’s says his mother “had Irish, English and Maori blood” while his father was “half English, half Maori”. Further back, his great, great grandfather was “a surgeon to Victoria’s household”. And Tui, still surfing at 80, is making his own mark in history, much like that of his legendary namesake, Tutanekai.